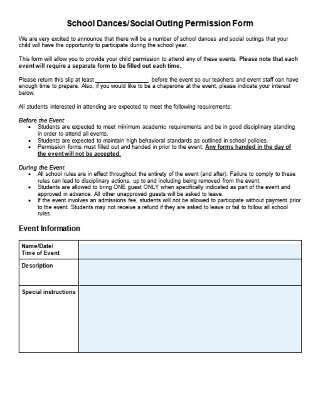 This editable printable permission form can be used for parent or guardian consent for student attendance at dances, socials, or other after-school events. Includes information on rules, requirements, deadlines, and event details, as well as pre-labeled spaces for name, signature, guest information, and consent. The PDF is editable and can be customized for individual classrooms and events.